I always have few different types of beans stocked up. Black eyed peas is one among those. We call it as "alasande bi" in konkani. Ridge gourd and black eyed peas are the best combination I have liked. Again this dish has the main ingredient coconut in it. These types of curry goes well with boiled rice. 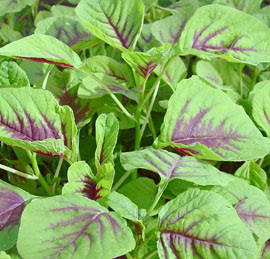 These leaves are called edible amaranth or red leaf . These are mostly used in China town and Southern Asia. We in konkani call it as tambdi bhajji. Tambdi is red and bhajji is leaves.At my home right from my childhood I have seen this being used in variety of dishes. We can prepare simple stir fry as it is nutritious yet very tasty. These are available even in Ranch 99 stores. I make sure we eat at least one green leafy vegetable once a week. Many a times we bring multiple leafy vegetables but minimum one is compulsory. The leaves were truly fresh and I had to pick them up. I relish most of the dishes prepared with green leaves. I prepared my mom's recipe sasam. This is my favorite ! Its been more than a month I did not update my blog with any new recipes. We had been to India :). It was great to be with family. Now its again time to get back to some experimental cooking. I had prepared motte (which means egg in konkani) phanna upkari. Phanna upkari is prepared also with mushrooms and fish. This is a spicy dish and goes well with rice, chapathi or even dosa. I want to try preparing this phanna upkari with cooked potatoes. If it comes well I will surely post the recipe. The best part of this dish is the color. I love it !